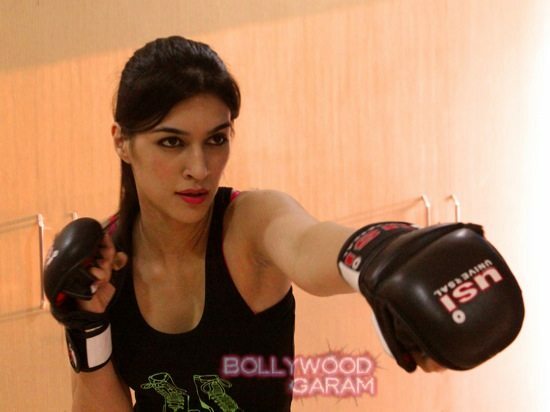 Heropanti actress Kriti Sanon gearing up for Singh Is Bling role. Bollywood actress, Kriti Sanon, who made her Bollywood debut with ‘Heropanti’, is currently gearing up for her upcoming release ‘Singh Is Bling’. Sanon is often seen practicing at the Grazing Goat Pictures office. The training session has been recommended by none other than the stunt master of Bollywood Akshay Kumar, since the role requires Sanon to do a few stunts. SIB is an upcoming action comedy flick directed by Prabhu Deva. The movie will also mark the return of Akshay Kumar in a Punjabi sardar’s character. The movie also stars Yo Yo Honey Singh, Rajpal Yadav and Quaiser Jamal. SIB is also another actor-director collaboration between Akshay and Prabhu Deva, after the commercial success of the movie ‘Rowdy Rathore’.